Come join us for a fun tour to learn about the history and culture behind this community! 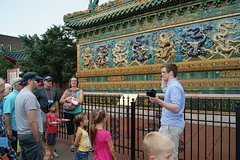 Whether you’ve come to Chinatown for years or it’s your first time, our Chinatown walking tour is ideal for you! Did you know that Chinatown is home to one of Chicago’s largest parks? Have you ever toured Chinatown’s Buddhist temple? Our public tour covers the historical commercial Wentworth Avenue, Chinatown Gate, Nine Dragon Wall, Landmark On-Leong Merchants Association (Pui Tak Center today), Chinese Buddhist Temple, St. Therese Catholic Church, Chinese Zodiac Square, the Four Greatest Inventions of ancient Chinese, Chinatown Mural, as well as Ping Tom Memorial Park. The 90-minute walking tour takes place on Friday, Saturday, and Sunday at 10 a.m. between May 28 and September 3, 2018 with options available on Memorial Day, Fourth of July, and Labor Day, Except July 15, 2018. Meeting at Chinatown Square by the Zodiac Animal Statues, guests will explore famous Chinatown landmarks such as The Nine Dragon Wall, St. Therese Chinese Catholic Church, the former On Leong Building, and Ping Tom Memorial Park. Tour-goers will have the opportunity to stop at various gift stores and bakeries along the way.